And that is another one of my babies in big school. Reception. It feels such a massive milestone doesn't it. Giving them to school full-time. 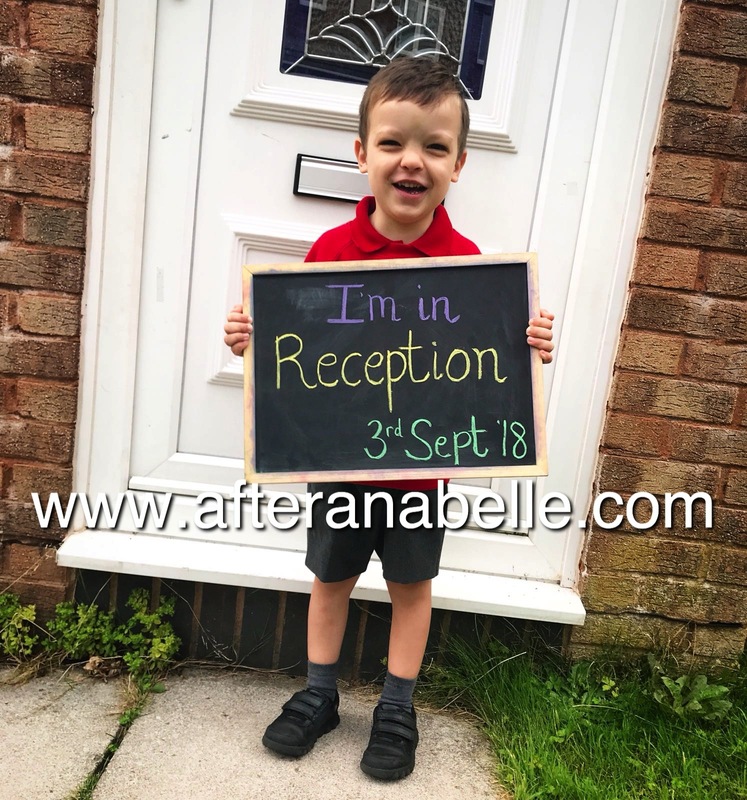 Even though Zac has been in the school building for 18 months already, this transition into Reception and staying all day still feels like a big deal. No more Monday and Tuesday afternoons; lazying around the house, going for a drive to get him to sleep, going to the park, pestering Nana and Bampi and meeting up with our Baby Club friends for an afternoon playdate. It is the start of a new chapter. The chapter where Small gets big. But will still be my Small of course. No more my baby but actually a school boy. I'm not really ready, and he isn't really either. Academically he is ready, more than ready really, for more educational challenge. He is a bright little button and often surprises me with what he already knows, and how quickly he learns. But emotionally, in maturity? I'm not so sure. Our little sensitive one, I really think the expectations and long days of Reception may well overwhelm him. I know he will rise to the challenge eventually, but as with most things I think it will take gentle nurturing and plenty of patience to get him there. So after two half days of settling back in, tomorrow he stays all day and tomorrow I go back to work too. 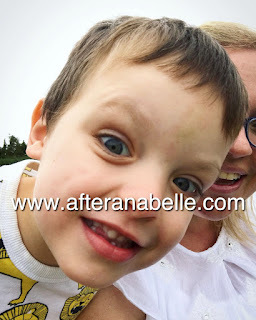 Today it really hit me that he has gone into Reception, that is was my last extra middle of the day school run (for a year, until Lucas starts - the forms for that also already arriving today), and our last afternoon. We marked it by going to the park for his last afternoon of freedom, before school claims him for all his best parts of the day. I can't deny I'm not looking forward to being able to plan a whole day, instead of days split into rushed two hour chunks because I always need to run back to the school for the next child. I can't deny I'm not looking forward to a year of 1:1 adventures with Luc on my days off. But at the same time I'm sad that Zac maybe didn't get as much 1:1 as he should, what with being the middle child. There was much less time with me on his own. And sad that school will get the very best of Zac during the week now, just as I was with Xander. Sad knowing how much he will change over this next year. That his baby days chapter is well and truly at its end. That its time to grow up now. This time I'm less naive and know full well how trying the next half term plus is going to be at home, with an overtired small boy (and slightly bigger boy! ); even these last two days of after school behaviour is already proving testing! Yesterday you started Reception. Even though you have only been mornings yesterday and today you have insisted on taking your lunch bag to school with you, with only your break time snack in. You love that you have a lunch bag for school just like Xander now, and there was no deterring you from trying to save taking it until Wednesday (tomorrow). You were insistent, that bag was going in with you on your first day! You have been a super star so far. Yesterday you were dressed and had all your bags ready to go at 8.00am and were cross that I kept telling you it was still too early to go. You were ready, even though Mummy was not. I was so nervous. But you? You walked so confidently through the classroom door, not looking back. Today, on morning two, I watched you find your peg straight away to hang your bag up on and delve straight into your classroom again. You have been awful grumpy in the afternoons these last two days though, and I kind of dread to imagine how the tiredness is going to catch up with you as the full days start rolling in! Yesterday, even though you had gone in to school happy, and came out happy, by the time we got through the house door you were telling me how stupid Reception was repeatedly and that the next day you were going back to Nursery! Haha! But the next day came and we heard none of it again this morning. I think you're happy so far in Reception. Today Mrs Perry must've been bigging up eating your lunch in the hall and staying all day the next day, because this afternoon, as well as being a bit grumpy and tired again, you've also told me lots that you are going to the hall for dinner tomorrow and that you want sandwiches with butter for your dinner. So it is time for an end of an era and a brand new adventure. Today the end of the era hit me. Oh its been an emotional kind of day with lasts and next steps. I'm so excited for you, for all you will learn this year, for all the growing you will do, and just know you are going to amaze us. I can't wait to hear all about your days, if you'll remember to tell me! We're going to be right behind you all the way, championing you on! We're so proud of you Zachy, and we love you so much, and don't you ever forget it! Our beautiful boy. One more step along the big wide world you go. "You're off to great places, today is your day, your mountain is waiting, so get on your way!" Go and Smash Reception baby, because you're going to be great! Here we are. The last week. The conclusion of our six weeks of summer two thousand and eighteen. What a time we've had! 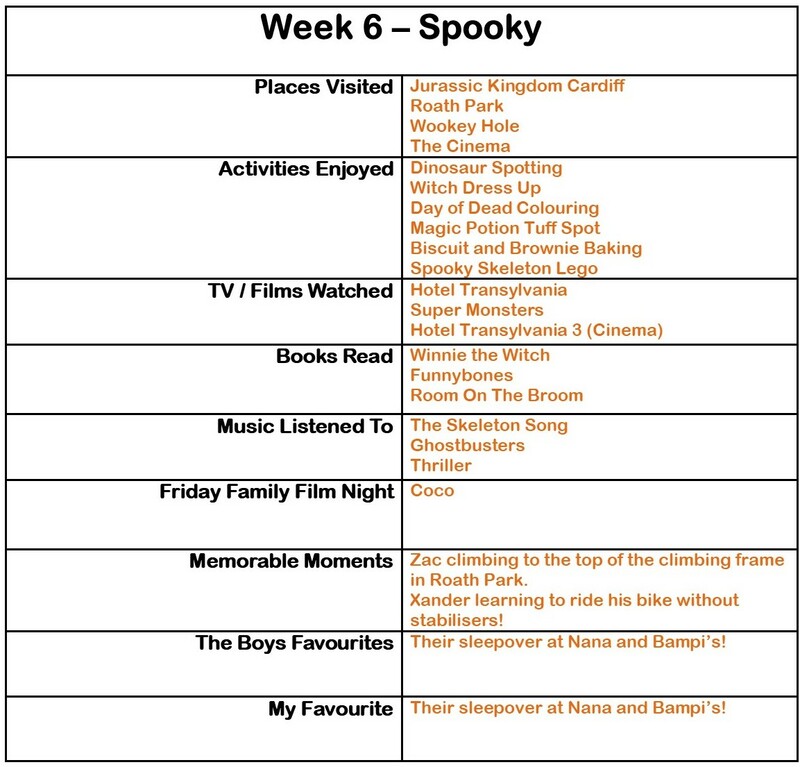 Week six has included dinosaurs, new spooky stories, witches, potions, sleepovers and date night and Big hitting a very big boy milestone! It is safe to say we are all pretty exhausted (I know, I know, summers are supposed to be restful but we prefer action packed!) and probably ready for the return of routine. It will be back to reality with a bump tomorrow, but one thing is for sure, I am absolutely not ready to give Zac to big boy school. Reception. Full time. He still seems far too little indeed. Wish us luck! 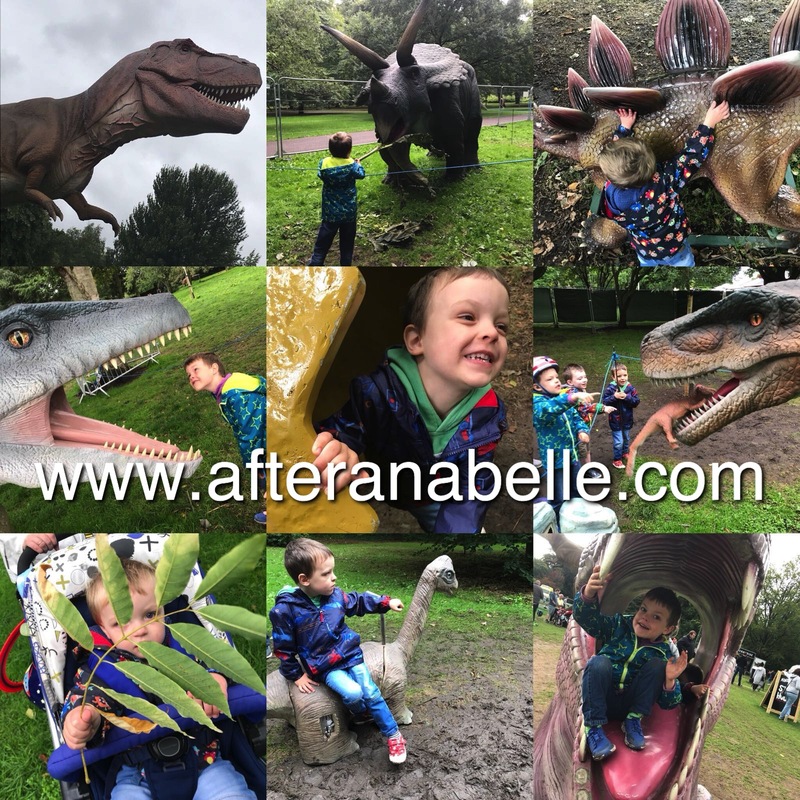 Monday we visited the Jurassic Kingdom in Bute Park with the extended family. The boys always love a day out with their cousins and were all really excited to see the dinosaurs. I was pleasantly surprised by the event after reading a number of pretty poor reviews about it. Although I think it was a rip-off and hugely expensive for what was really an hours walk around, and I agree the dinosaurs could have been in better condition and more made of them. 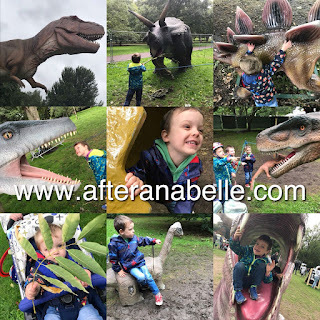 The boys had a great time, running from one dinosaur to the next, loving when they moved and enjoying pretending to feed some of them. 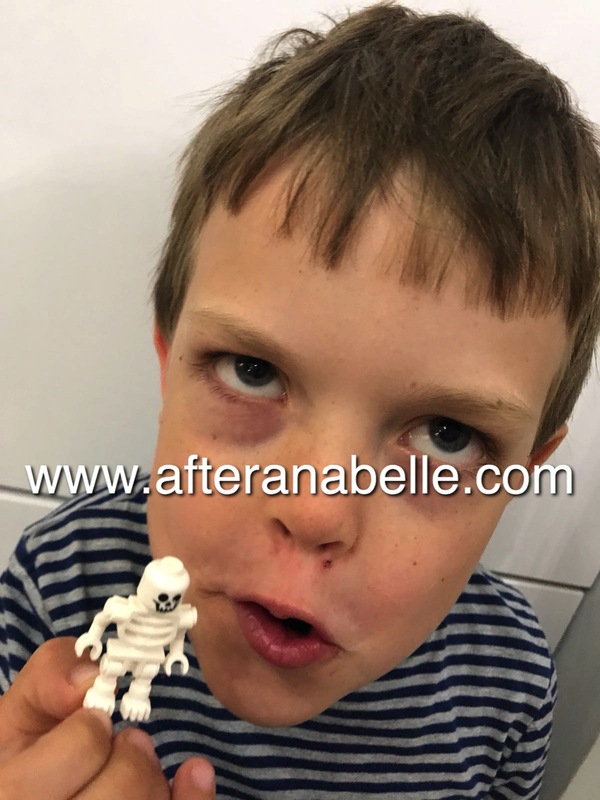 Ok, so the only one who found the dinosaurs remotely 'spooky' (scary) was Luc who now often needs persuading to sit in his buggy for any length of time was requesting to be safely secured in his buggy away from the dinosaurs! Dinosaurs, the park, bike riding outside Nana and Bampi's and a take-away made a great bank holiday Monday. Today we met up with some of our nearest and dearest friends aka Baby Club for a day at the park. Zac proving ever the dare devil. 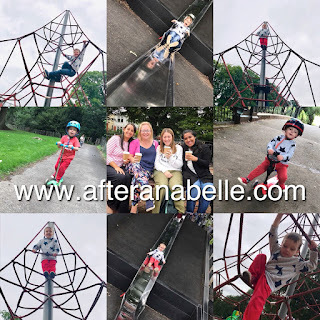 Yesterday he had been flying around the crows nest climbing frame at the Boating Lake and today at Roath Park he had climbed right to the top of the expectionally higher climbing frame there. Enough to turn spook me and turn me grey that's for sure! A nice day followed a rather stressy evening of paying a hall for a birthday party; it took 3 visits by the time the job was done, between not being open when got there, having to return after solo swim lessons, then to be told it was cash only, to go away and come back again and then finally feed the children tea at 7.30pm and get them to bed even later after that! Big Boy Wednesday took us to Wookey Hole this week. Although Zac was tired from the moment we got there and out of sorts, surprising me with not really wanting to say hello to the Wookey Witch despite being incredibly excited that morning to be wearing his witch costume! 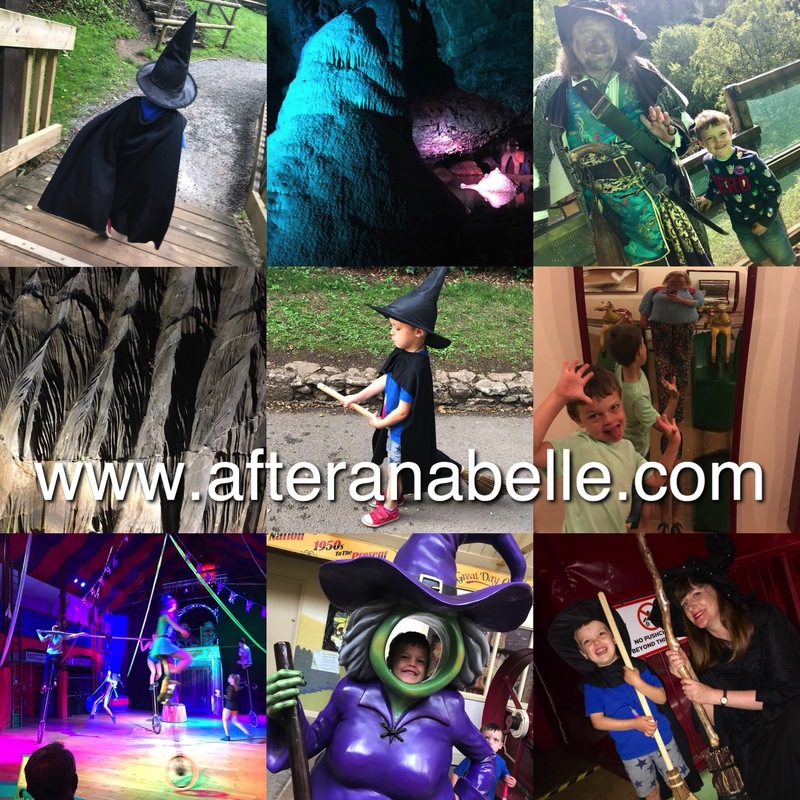 But anyhoo the boys had a lovely day, exploring the caves, especially watching the circus show and playing in the soft play area. And then, after buying him a broom from the shop, and an ice lolly, Zac perked right up and decided he wanted to show the Wookey Witch his broom - so me being the soft touch I am went on a hunt for her before we left for home. Look at his little happy face with her! 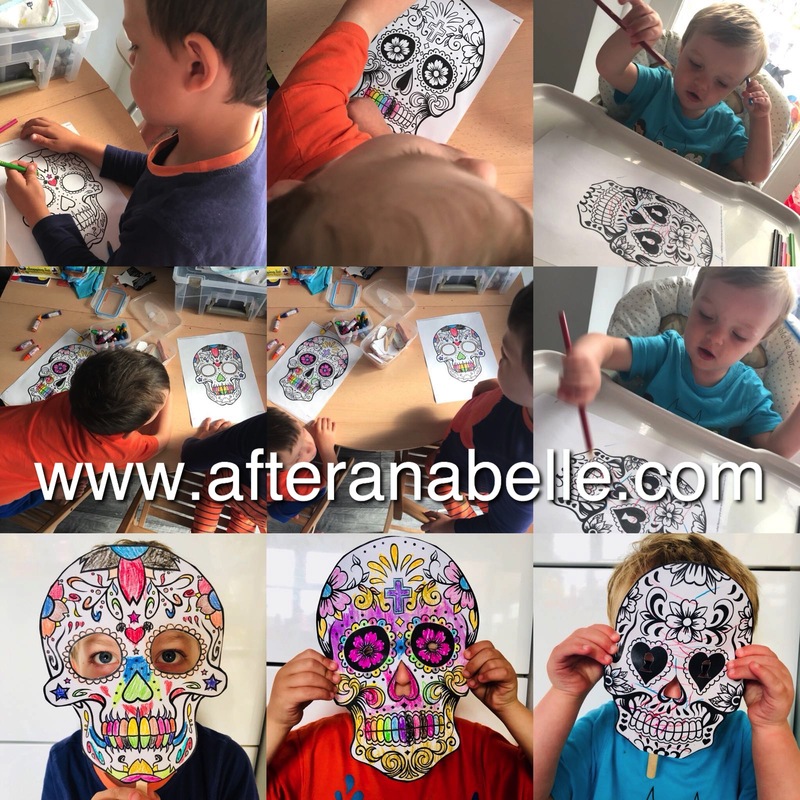 Day of the Dead colouring, patterns and masks, followed by a magic potion tuff spot meant a morning of colourful and messy fun. The tuff spot was a big hit; bowls and cups of water, food colouring, washing up liquid, glitter and gellibaff mix and letting them have free reign to explore and create a potions meant lots of mess. I was glad I had left them in their pyjamas to play! They managed to get splashes of food colouring all over the conservatory and all over themselves. All three boys were so engrossed and played so nicely together, sharing and interacting, sporadically shouting 'Iggity Ziggity Zaggety Zoom' as per Room on the Broom. 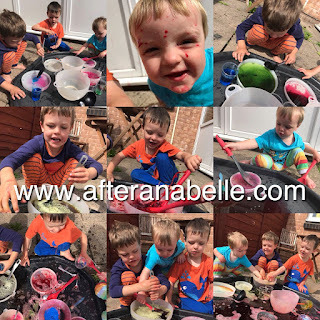 They mixed and splashed for over half an hour and would've gone on much longer had we not planned to go to Nana and Bampi's for dinner and then their sleepover night and afternoon of baking. See the before and after pictures! Yes Thursday was a real treat. The boys had a sleepover and Jon and I had date night. 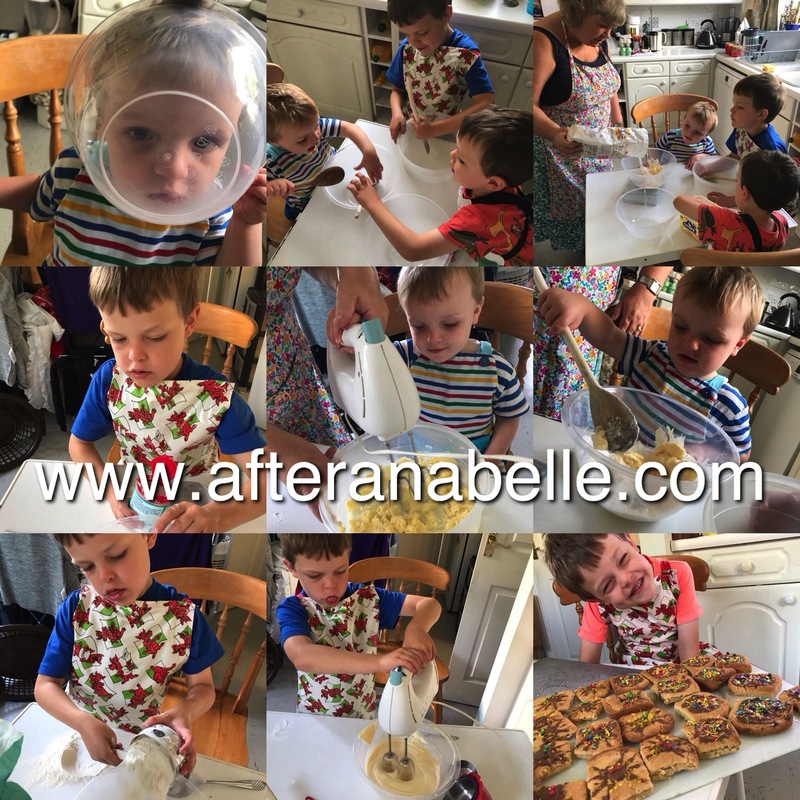 We went to the cinema to watch Christopher Robin and enjoyed a meal at Zizzi's. And the best bit? Getting a lie in until 11.15am the next morning! Haha! Well apart from the lie in of course, Friday's highlight was Xander. Our little superstar, after only having 3 sessions on his 'balance bike' since Saturday, and only two of these being 'proper' sessions, tonight he asked for the pedals back on. Then he told me to let him go. And away he went! 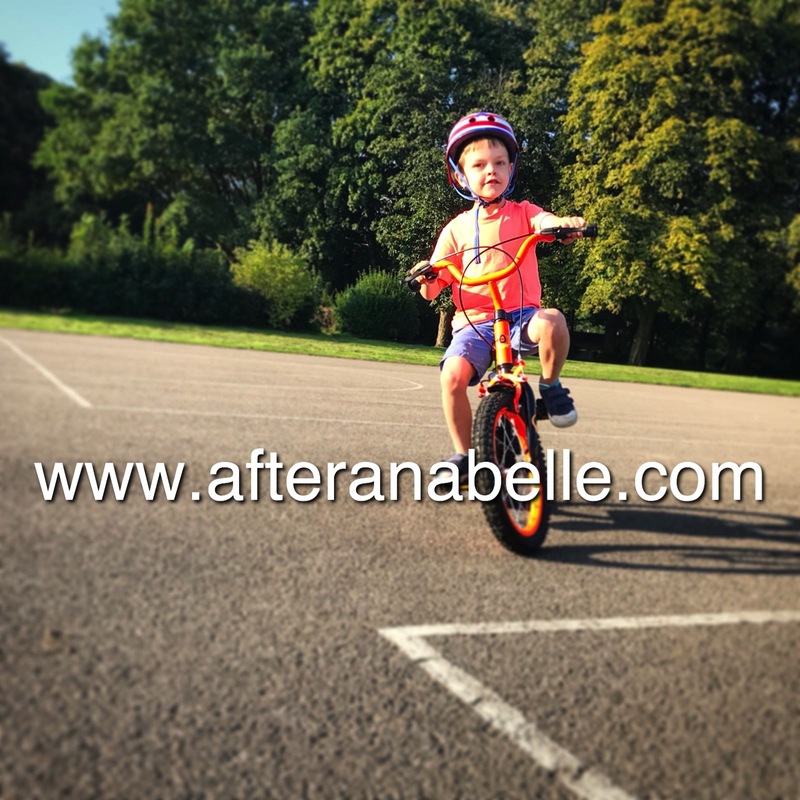 Cycling, balancing, pedalling, all by himself and without stabilisers. What a difference a week makes with his Self-Believing Sam Can-Do Attitude. As you can tell I'm so super proud of him! Spooky lego with a skeleton mini-fig surprise gifts, Pizza night and family film night. And after colouring our own Day of the Dead skulls we decided the film of the week had to be Coco! Today we went to Barry to celebrate our friends twins 5th birthdays, and then after that took the boys to the park for some more bike riding. Zac asked for his bike to be a balance bike like Xander's and had a really good first go although very soon decided he would like the stabilisers and pedals back on please and decided he would do it when he was 5! Haha! We'll take his lead for now. 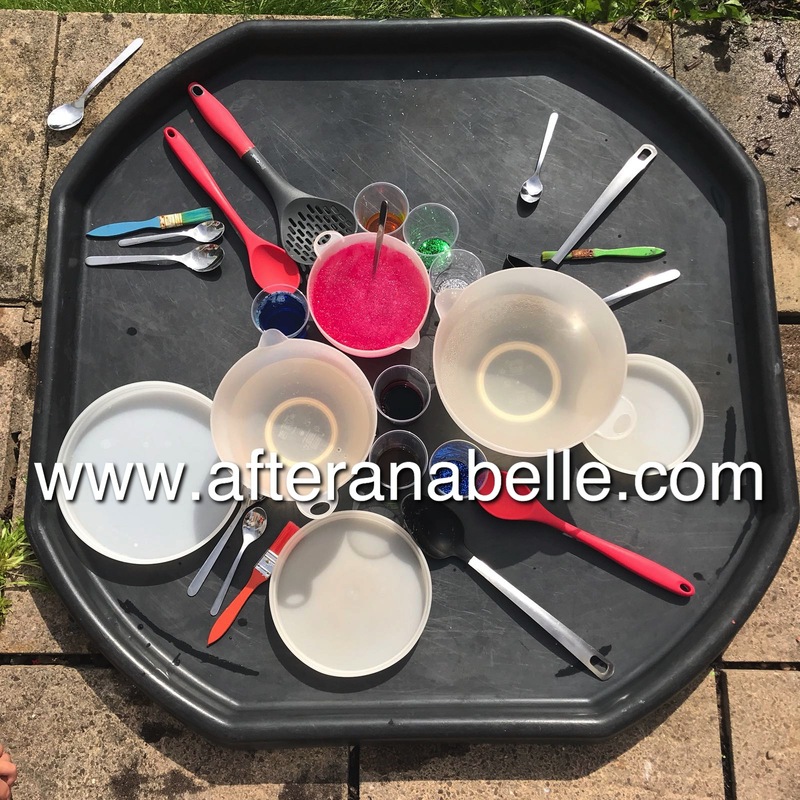 I must be honest the afternoon was super hard work by the end and the boys were so obviously tired so it was back home and all three boys were in bed at 6.30 tonight after a Room on the Broom bedtime story. And today. The very last day of our summer holidays. The boys had a lazy morning at home whilst I went to church, and played the piano again. Then we've had dinner and I went with Mum and Dad to 'Praise In The Park' with their church while Jon took the big two to the cinema for the afternoon to watch Hotel Transylvania 3. A nice fitting spooky end to our spooky week. 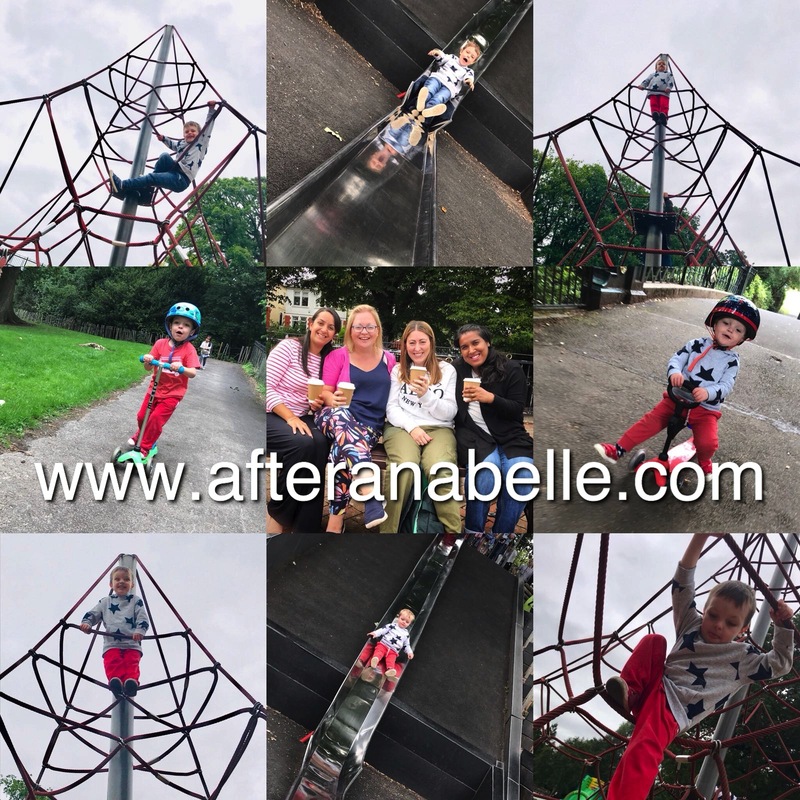 Another bike ride and play in the park followed until it was time to go home for tea, bath and bed and to get everything ready for Back To School tomorrow! Can you believe it? Where did those 6 weeks go!? Tomorrow will well and truly be back to reality. It is always a strange feeling a new school year. Anticipation and excitement mixed with wanting to hold tightly onto these little boys and sadness that each passing year gives them a little bit more to the world. Their new year group always sharply highlights how much older they are always getting. Year 2 for Xander, Reception for Zac (and this time next year Luc will unbelievably join them too!) The last and first year of infants. Xander is already planning next summer and has asked for a Lego week next year... 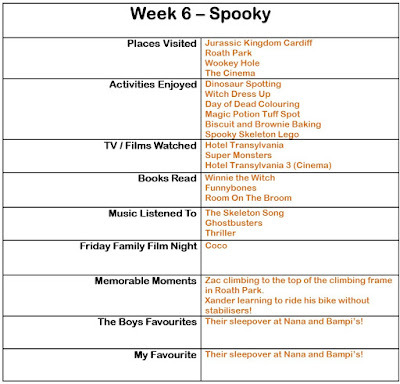 But there is always lots to look forward to in the Autumn Term too. The start of my adventures with Luc while his brothers are both at school all day, plus we have a visit to Plymouth next weekend for my niece's Dedication, more time with friends after that, a weekend away planned at the end of September, Xander's birthday plans, half term, Zac's birthday plans, the boys next sleepover, Christmas weekends away and Christmas. Here is to the start of another school year. Next on my job list tonight is starting to put together some Dear Zoo sound effects for my own class! Happy new year. Happy summer.